In this tenth edition of The Wandering Cheesemonger, our blogger-on-the-road, Grace, arrives in France and is greeted with some famous friends. After a whirlwind of rushed re-organizing sparked by the French Consulate changing the requirements to get a visa days before my appointment, resulting in my visa request being denied, I am finally in France (if with a slightly different trajectory–stay tuned for more updates). I’ll arrive at the farm in Brittany tomorrow at noon, but for now I’m eating my way through Paris. 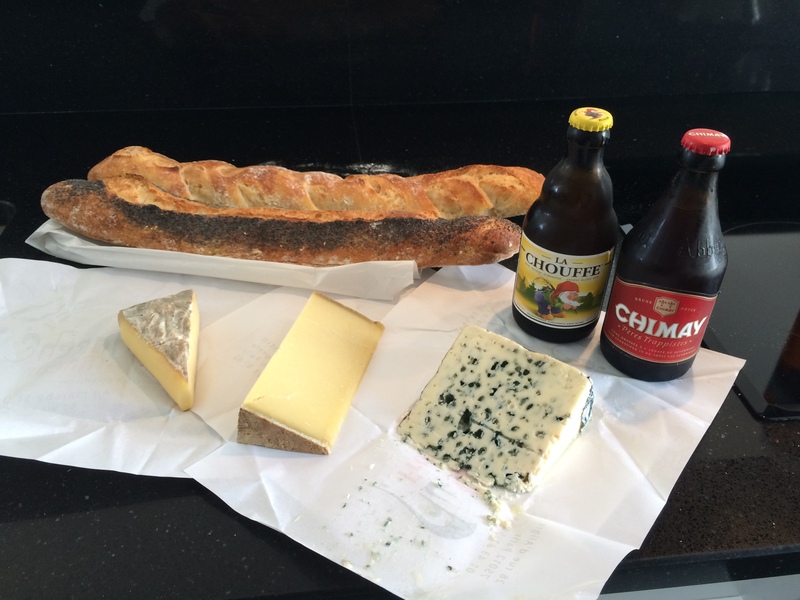 Today for lunch, my friend Matilda and I went to a traiteur du fromage close to her apartment to pick up a few cheeses, grabbed a few baguettes from Maison Kayser (my personal favorite Boulanger in Paris, even after tasting the top ten ranked baguettes in the city), and topped it off with a few Belgian beers. We considered salad but decided against it–you don’t want to fill up on greens and not be able to eat as much cheese, right? We only got 3 cheeses, but we went for some French favorites that can’t really be found in the U.S. (or at least not in such good shape as in France). The cheese on the left is Saint Nectaire, a semi-soft washed rind cows milk cheese from the Auvergne region of France that is usually aged around 2 months. Saint Nectaire’s soft, gooey paste has a rather mild flavor–slightly nutty and almost mushroomy flavors are undertones to the primarily creamy taste this cheese leaves as it melts in your mouth. The cheese in the middle is Beaufort, often considered the king of cheeses. This alpine cheese, somewhat similar to a Comte in style, is made of cows milk and generally aged between 12 and 16 months. As with many alpine cheeses, Beaufort is creamy in texture but has a strong nutty flavor. I forgot to ask at the store whether this was a Beaufort d’hiver (made in the winter) or a Beaufort de Savoie (made in the summer), but I would guess that this was d’hiver because of its extremely strong flavor and pungent odor. In contrast, the summer Beaufort is more floral and mildly creamy, a direct result of the difference in the diet of the cows. Cows grazing on fresh grass and herbs produce milk that reflects these characteristics, while the milk from cows being fed hay in the winter will produce a completely different flavor in the Beaufort d’hiver. The last cheese is Roquefort, another pièce de résistance of French cheesemaking. Roquefort is a sheeps milk blue cheese, usually aged around 3 months, with a strong and salty flavor. This is blue at its best, with a sharp, tangy flavor that hits you immediately, mellowing off in to a creamy and sweet finish that lingers on your tongue long after you finish eating. This cheese isn’t for the faint of heart. The first time someone tastes it, I often watch their faces register disgust, then confusion, and finally ecstasy as they reach for another piece.